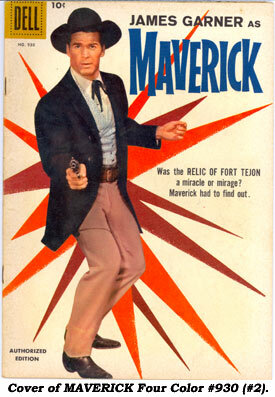 Dell Comics didn’t wait long to jump on the immediate TV popularity of Warner Bros. “Maverick” which began on ABC in Sept. ‘57. By April ‘58 Dell had adapted the first episode “War of the Silver Kings” into comicbook form for Four Color #892.
with FC #1005 (#6 July/Sept. ‘59) Dell turned to original stories, many written by prolific TV writers for many shows Eric Freiwald and Robert Schaefer. 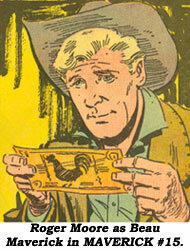 Although all issues were well written with the Maverick brothers’ elaborate scams and deals coming across fine in the comics, the comedy element—the twinkle in the eye factor—was hard to convey to the comic page. A sales success for Dell, regular numbering began with #7 (Oct.-Dec. ‘59) and even became a bi-monthly publication with #8 (Jan.-Feb. ‘60). 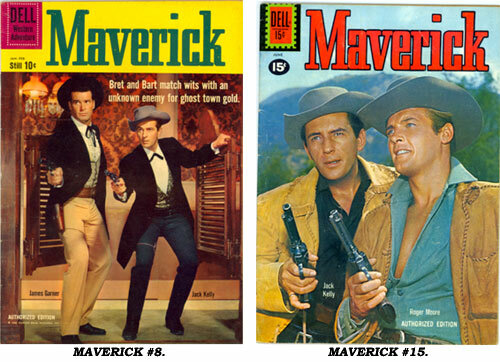 MAVERICK stayed bi-monthly through #13 (Nov.-Dec. ‘60) when it reverted to quarterly with #14 (Jan.-Mar. ‘61) and remained so until its four year run ended with #19 (April-June ‘62), concurrent with the end of the series on ABC in April ‘62. Roger Moore, #18 was Kelly and Robert Colbert and #19 was Kelly alone. Photo back covers were only on FC #930 and FC #962. Most issues also had inside front cover photos. 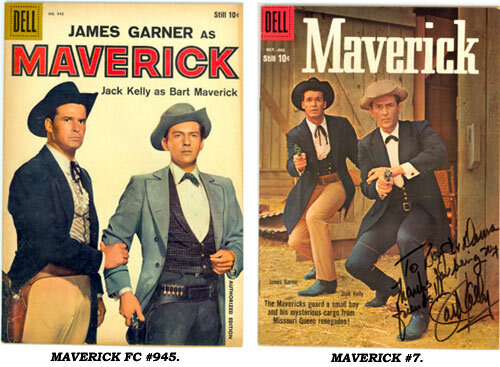 The excellent artwork was by Dan Spiegle (1920- ), one of Dell’s most talented contributors who also drew stories for ANNIE OAKLEY, JIM BOWIE, BAT MASTERSON, BUFFALO BILL JR., COLT .45, RANGE RIDER, GENE AUTRY, JOHNNY MACK BROWN, LAWMAN, DALE EVANS, SHOTGUN SLADE, WAGON TRAIN and other Dell westerns. 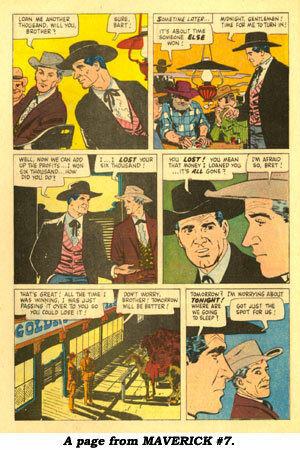 Spiegle also drew the HOPALONG CASSIDY Sunday and daily comic strip from ‘49-‘55. OVERSTREET COMIC BOOK PRICE GUIDE values FC 892 (#1) at $63 in Fine with the other six Four Color issues at $33. 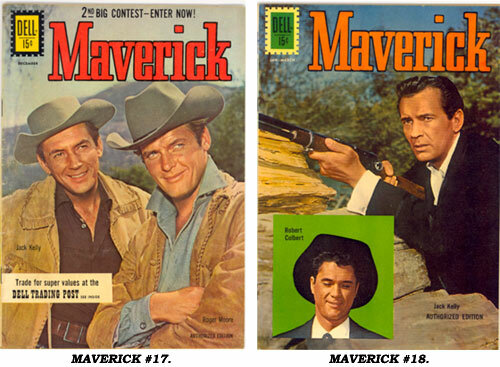 #7-19 can be found around $25 in Fine, but look in particular for FC #962 as a souvenir of the delightful MAVERICK series.